Phelps Helps U.S. Men Win Relay Gold In Rio; Manuel Helps Women Snare Gold : The Torch Michael Phelps wins his 23rd career gold. 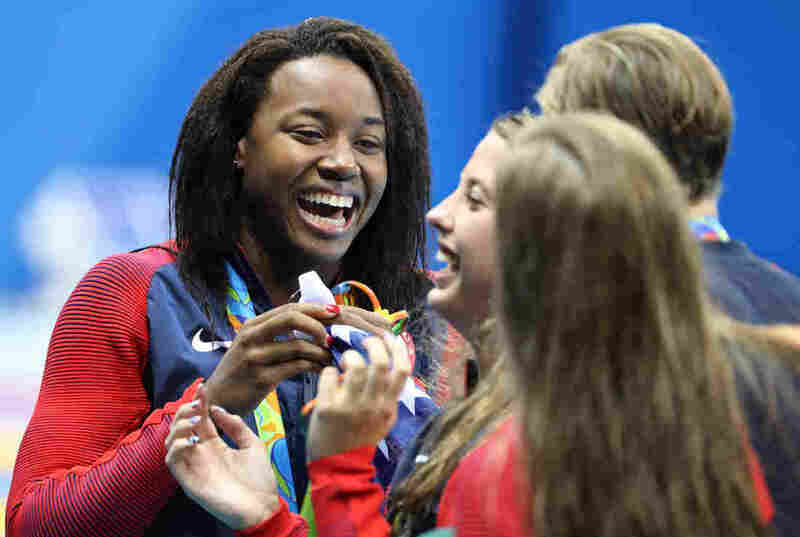 American Simone Manuel picked up a silver medal and a gold, as she swam an individual race and anchored the women's medley. 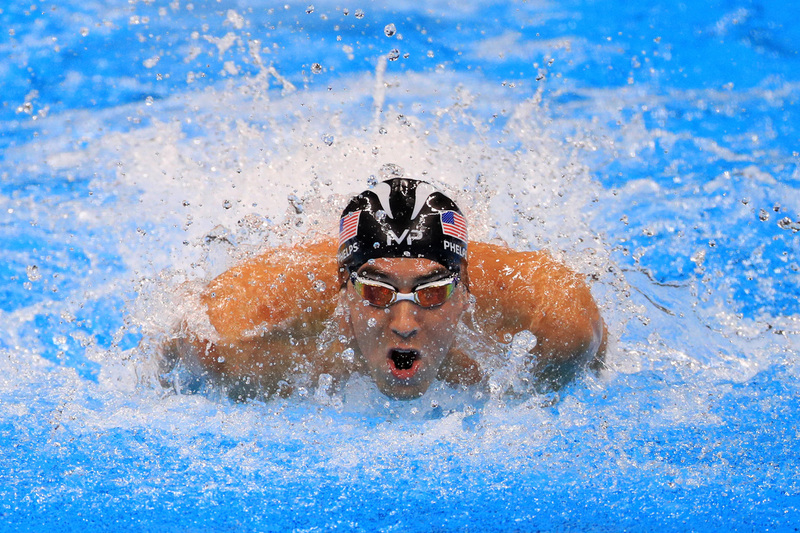 Michael Phelps of the United States competes in the Men's 4 x 100m Medley Relay Final on Thursday. Michael Phelps dropped both the hammer and the mic on the Rio Olympics Saturday night, turning in a scorching butterfly leg in the men's 4x100m medley relay that helped his team secure gold and set a new Olympic record on the last night of Olympic pool swimming in Brazil. Both the American men's and women's medley relay teams repeated their golden races of the London 2012 games, with the women's relay bringing Team USA its 1,000th gold medal in the Summer Olympic Games (dating back to 1896). Tonight, we also saw newly minted Olympic champion Simone Manuel – who made history this week as the first African-American woman to win a gold medal in swimming — grab a silver in the 50m freestyle before diving back in the pool later to anchor the women's medley relay. The men's medley started out in world-beating fashion for the U.S. — leading off in backstroke, Ryan Murphy set a new world record in his 100-meter portion of the race, at 51.85 seconds. Afterwards, he said the adrenaline and the desire to give Phelps and his teammates a strong start gave him a boost. Murphy also relayed what Phelps told his teammates before the race: "You know guys, I don't really have anything to say. Let's just go out there and kill it." "That was enough for me to get hyped," Murphy said; he added later that this was his first race alongside Phelps. And he said that no matter what country a swimmer competes for, they owe a debt to the decorated American for helping grow the sport. When Phelps spoke after the race, he said, "I think it was a challenge getting back to this point — but this is the cherry on top of the cake." As for what Phelps did in the water tonight, he turned in a time of 50.33 — a second faster than Britain's James Guy (whose team took second) and nearly a second better than the 51.14 he clocked in last night's 100-meter butterfly final. That final was won by Joseph Schooling, in 50.39. The win brought Phelps his 23rd gold medal and his 28th Olympic medal overall. And from the way he spoke afterwards, it seems as if this might really be his final Olympics. "Getting off the bus walking into the pool tonight, I almost felt myself starting to cry. Last warm-up, last time putting on a suit, last time walking out in front of thousands of people representing my country. It's insane. A lot better than what it was four years ago. This is how I wanted to finish my career, the way I wanted to. I held back a little bit on the podium but there were some that were popping down. It just feels good to know that the hard work did pay off and I was able to fight through some of the times that I went through the last two years and get back to where I actually wanted to be. This was the actual cherry on top of the cake and looking forward to starting a new chapter." U.S. Swimming had hoped to close Rio's Summer Games with a bang, to match the stellar performances they've had in what could be Phelps' last Olympics ever. The swimmers delivered: In addition to the races we've already mentioned, Connor Jaeger set a new American record in the men's 1500m freestyle and won a silver medal. We'll update this post with news from the event in Brazil (so be careful if you don't want spoilers). After a pronounced delay, the winning relay teams from the U.S., Britain and Australia emerge to take the medalists' podium. Perhaps Phelps and his teammates just couldn't bring themselves to let the curtain fall on this Olympics, and possibly his career — the wait was never explained, and the crowd got restless. But all is forgiven as they walk out. The swimmers from all three nations cannot stop chattering and talking. Seems to have been no friction for them backstage. Even before the bronze medalists are introduced, Phelps rests his foot on the top podium. Is he ready to get this over with? He looks around, waving to fans left and right. He's enjoying the moment, after a string of phenomenal Olympics dating back to . Then the ceremony begins and it's a straightforward affair. The mood is much lighter on the podium than it was for Phelps' last individual medal. Here, he's chatting with Nathan Adrian and his teammates. After receiving their medals, the swimmers all walk over to the camera banks — and the U.S. athletes hold up a banner that reads, "Thank you Rio." The crowd is very pleased. The American men hold the world and Olympic records in this event — 3:27.28 for the world record that was set in 2009 and 3:29.34 for the Olympic mark that dates to Beijing 2008. They set a new Olympic mark tonight at 3:27.95, in a race that was very close in the first two legs before Phelps created a cushion that Nathan Adrian sealed with a blazing finish. Great Britain won the silver medal with a time of 3:29.24; Australia came in close behind to win the bronze at 3:29.93. The crowd at the Olympic Aquatic Center in Rio was going wild before Phelps dove in. The fans got louder as Phels pounded down the pool — and they roared as he used his turn to perform one of those ultra-long underwater pulls that helped him become both famous and feared. After the race was over, relative quiet returned to the arena. But it exploded again moments later — Phelps, at 31 the most decorated Olympian of all time, had just stopped packing his gear, stood, and turned to the stands, raising his arms and acknowledging the fans. He kept his arms up and waved, in what could be his last time on an Olympic stage as a competitor. Phelps and Adrian were teammates on the 2012 gold-medal team. This is an event the U.S. has owned: the Americans have set the past 10 world records in this relay, dating back to 1984 at the Los Angeles Summer Olympics. After her teammates put her at the front of the women's relay, Lilly King created separation in her breaststroke leg of the medley before handing off to Simone Manuel — who turned the race behind her into one for second place. There's only one holdover from the 2012 gold medal team: Dana Vollmer. In London, she swam this relay with Rebecca Soni, Allison Schmitt, and Missy Franklin. Denmark's Pernille Blume wins the 50-meter freestyle, narrowly edging American Simone Manuel. Blume finished in 24.07; Manuel in 24.09. As we digest those results, the Olympic Aquatic Center resonates with the booming sound of the DJ Snake and Lil' Jon opus, "Turn Down for What." In true Olympic pan-cultural fashion, the next song: "Enter Sandman." One entire contingent seems to be singing the whole thing. To pick these teams, Team USA has the luxury of calling on several swimmers who won medals in their individual disciplines, from Lilly King (gold in the 100-meter breaststroke) to Ryan Murphy (gold in the 100-meter and 200-meter backstroke). The women's race was set for 10:49 p.m. local time in Brazil, which is an hour ahead of U.S. East Coast time. But NBC will time-delay its broadcast for an hour, so it will air at 10:49 p.m. ET. The men's race follows at 11:04 p.m. ET. The top threats to the U.S. men will likely come from Great Britain, which posted the fastest time in qualifying heats – and is hungry for a medal after finishing fourth in this event at London's 2012 Olympics. Other contenders: Japan, the 2012 silver medalist, and Australia, which took bronze at the last games. Those two teams were third- and fourth-fastest in qualifying. Also racing: China; Russia; Germany; and Brazil.